Some of my favorite things to order at Chinese restaurants are the dishes I won’t make at home, basically anything battered and fried. I’m not lazy, I just don’t enjoy cleaning up the splattery mess I always seem to make when frying. Orange chicken is one of my favorites, but I always save it for eating out. Helen Chen’s new book, Easy Chinese Stir-Fries, has a modified recipe that turns the classic battered and fried dish into a quick stir-fry. Some Chinese restaurants ruin orange chicken by making it overly sweet, but Chen’s version gives you orange flavor without all the sweetness. After tasting it the first time we decided we wanted more orange flavor in the sauce and started adding orange zest. I also like to use slivered fresh red jalapeno and used it as colorful garnish at the end rather than the dried chiles. 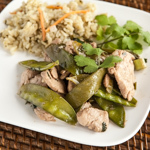 Adapted from Easy Chinese Stir-Fries, by Helen Chen (review). In the medium bowl, stir together the wine and cornstarch. Add the chicken and mix well. In the small bowl, stir together the sugar, vinegar, soy sauce, orange juice concentrate, and orange zest (optional). In the wok, heat 1 tablespoon of canola oil over medium heat, until the wok is hot but not smoking. Add the snow peas and cook while stirring just until they turn dark green, about 30 seconds. Remove to a platter, spreading them around so they aren’t layered on top of each other. You want them to stop cooking. In the wok, heat the remaining canola oil with the peppers. If using dried chiles, cook until they turn dark brown, almost black. Discard. If using sliced jalapenos, cook until the edges turn dark, then remove to a small bowl. Set aside for garnish. Add the garlic and ginger and stir around the pan a few times until they sizzle. Increase the heat to high and add the chicken. Stir for about 1 minute, then add the orange sauce and continue stirring for another minute or two. When the chicken is almost done, remove the garlic and ginger slices. Add the mandarin oranges and stir gently to heat them and finish the chicken, about 1 more minute. 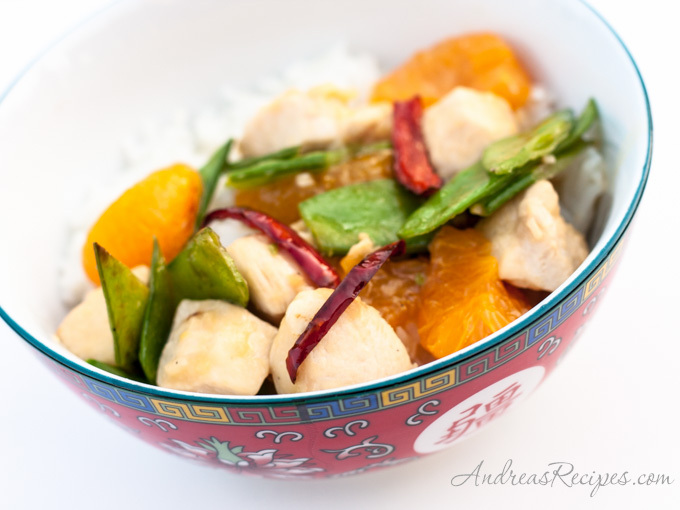 Spoon the chicken and oranges on top of the plated snow peas and serve immediately with steamed rice. This is so fresh, healthy and delicious looking! I save the fried dishes for the Chinese restaurants also because of the mess I always make! Yes yes yes thank you for this healthy alternative!! 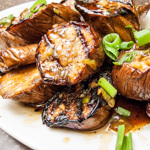 Homemade Chinese food is so much better than ordering out – better for you and less greasy! 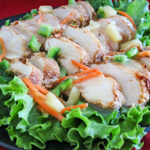 I don’t like mandarin oranges but maybe I’d make this with a sub for them – sounds so good otherwise! Delish. I love asian food, but hardly ever cook it. Go figure. I guess I just prefer it when somebody else is doing the cooking. What a great recipe! I love your blog and photos, so happy to have stumbled across it! I love that this recipe doesn’t use tons of sugar! I have had so much trouble finding ones that weren’t so sweet.